Many times I have seen question from others that how can we write trigger on attachment in salesforce. For the Attachment, ContentDocument and Note standard objects, we can’t create a trigger in the Salesforce user interface. For these objects, we can create a trigger using development tools, such as the Developer Console or the Force.com IDE. Alternatively, we can also use the Metadata API. In this example we will learn to write trigger on attachment object in salesforce. Firstly I will explain using developer console. 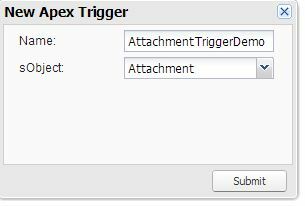 Here are steps to create trigger on attachment using developer console. 2. 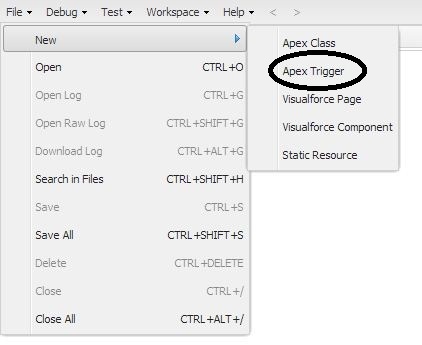 Go to File -> New -> Apex Trigger. 4. Click on submit button. In this way we can create trigger on attachment. In similar way we can also create trigger using force.com IDE. We should be very careful while writing the trigger on Attachment, as it will be used by all standard or custom Object on which attachment is added. We should provide criteria to run trigger so that trigger should be executed for required objects only. In this example I will create the trigger which will check for the parent object “Account”. If the object is Account then it will update one field on account record.